This walk is a marvel, with outstanding views of Madeira’s contorted central mountains from its highest ridge. One of Madeira’s absolutely finest walks, and that is saying something. Spectacular, colourful peaks and cliffs; lush forested hillsides, and the sea far below. But often cloud-bound, so choose your day. This walk is a marvel, a demanding and often vertiginous path cut into the rocky flanks and and cliffs of Madeira’s highest ridge, with outstanding, indeed thrilling, views of the peaks, cliffs, gorges and forests of the island’s crazed centre, with the sea far below. It is one of Madeira’s absolutely finest walks, and that is saying something. The path starts at the roadhead at Pico de Arieiro (1,818m) at the south-eastern end of the great horseshoe of mountains that form Madeira’s highest massif. It is home to a NATO radar station, and has surprisingly gentle upper eastern flanks, so has a good access road to its very peak. So, don’t expect to be alone there: busloads throng the peak. With easy access to Achado do Texeira near Piuco Ruivo, this makes for easily accessible walking, and thus crowds on the trail, too. Do start as early as you can, to meet fewer people, get the sharp early morning light (dawn on Arieiro is a marvel) and have the best chance of a cloud-free day. The many delights of this remarkable walk include the weird and wonderful volcanic evidence all around you: the spectacular, colourful peaks, cliffs and towers, the jumbled strata and hard-rock dykes, the old plugs. You are above the treeline most of the time, but below you are lush forest and thick, colourful scrub, further below the hardscrabble terracing of the upper farmland. In the distance, the eternal sea. The path is a miracle of engineering, cut into sheer cliffs or teetering on knife-edges, labouring up or down impossible slopes by dint of carefully constructed steps and sections of metal ladder-steps, and passing through five tunnels, some hundreds of metres long. The trail is almost immediately thrilling, dropping to a very narrow ridgetop, then down along the eastern flanks of Pico de Cidrao into the gap between it and the huge, wildly broken Torres mass, Maderia’s second highest mountain. There are two ways round Torres, but, as of 2017, the eastern route is unworkable due to collapse, a tragedy given the immense work it must have taken to construct. So, you wind round the west, steeply up and down, teetering along galleries hewn into the cliffs, passing through 5 tunnels of varying length and detouring via fixed metal step-ladders to deal with the path collapse. An amazing walk. You eventually reach the pass between the western and eastern cliffs, between Torres and Ruivo itself, which appears as a ridge topped with a peculiar high wall formed by a hard-rock dyke, but is of course much higher than we can see from this high-walled pass. 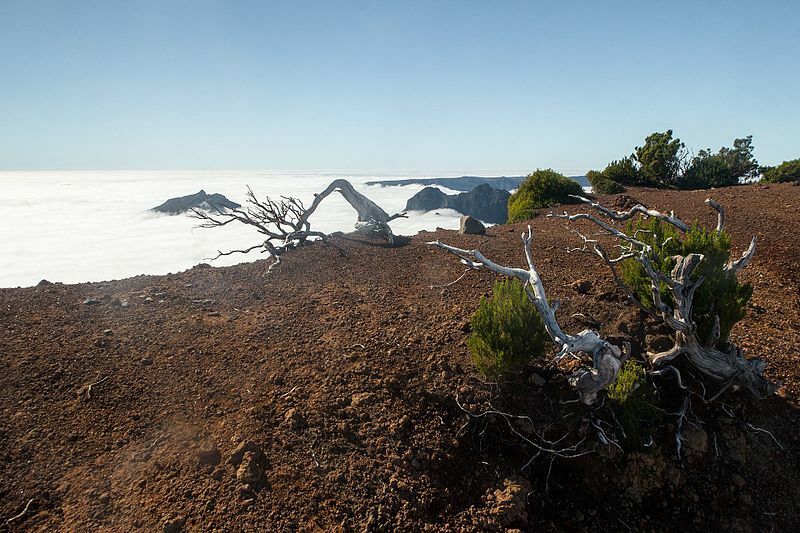 A long, steady climb takes you up the eastern flank of Ruivo, through the eerily beautiful bleached branches of dead trees (fire) to a junction, on the ridge at the top, with the Achada do Teixeira/Ruivo track. Turn left and climb to the resthouse, where you will meet crowds of walkers eating their lunches and refilling their bottles. It’s another 20 minutes or so climb to Ruivo (1,862m), the highest point in Madeira. Expect world-class views if your day is still clear! You can either walk back to Pico de Areeiro to make a 12k/6hr walk, which you will need to do if you have come by car; or on to the roadhead at Achado do Texeira, 2+km east of the resthouse, for a 9km/4hr walk, which is most people’s choice. You can, indeed, head west along the high central ridge [link later] via Pico de Eirinhas, Boca das Torrinhas, Pico do Jorge, and Pico da Encumeada to the roadhead at the Boca da Encumeada at the very heart of the island, but this is would make a very long walk which only the really fit should consider. The high peaks are often cloud-bound and walking this trail in thick cloud would be pointless, so choose your day and in any event start early to get the views. 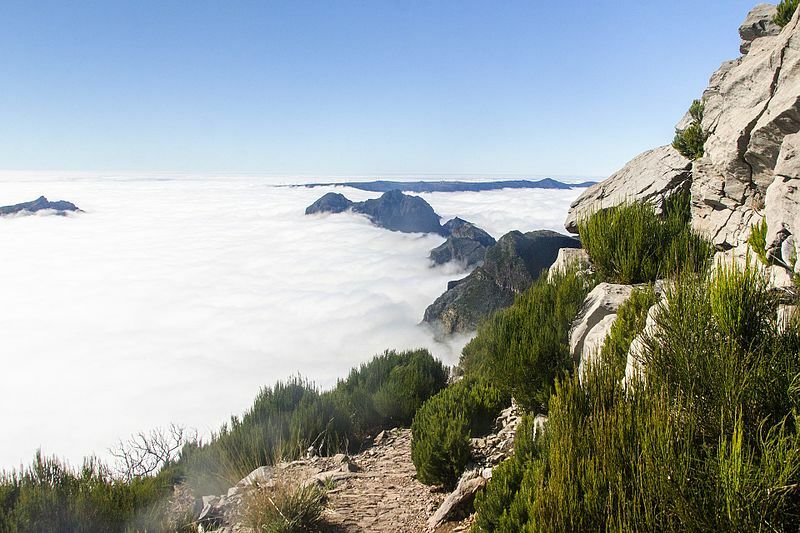 Dawn is said to be spectacular, although Walkopedia didn’t get on the trail until 10am, as a result finding Ruivo in tantalizingly shredded mist, although the rest of our walk was so good we had banked enough delights to simply feel thankful. This is, with reason, a famous and popular walk, in every guidebook and on every walking company itinerary. So, don’t expect to be alone, indeed you may have to time your breaks carefully to avoid getting caught up in a caterpillar easing its way along the narrow paths. The paths are well maintained, but with a lot of paving and an excess of post-and-cable fencing, which does affect the feel of the walk. In the end, though, the extraordinary trail and landscape render these minor irritants. Beware that the Cicerone is out of date as of 2017 – it shows the tunnel route as closed and the eastern Torres route open, whereas it was at his time the opposite way round. Do check which route is open before you start, as slips and rockfalls can close trails. Transport: if you do a there-and-back walk, you can drive. Otherwise, you will need to swallow a taxi.